Recently I gave you some of the many reasons why building with a prefabricated steel building kit just makes sense. (Please see “Why You Should Buy a Prefab Metal Building.”) Then I explained the advantages of the RHINO steel building products. (See “Why You Should Choose a RHINO Metal Building.”) Although we are very proud of our top-of-the-line steel building systems, our products are just half of what we call The RHINO Difference. The other half is our commitment to provide customer service that exceeds your expectations— before, during, and after the sale. Our goal is to offer the finest products and service in the metal building industry. No business can succeed without repeat customers. A customer service study done in 2010 concluded 82% of customers stopped doing business with a company after experiencing poor customer service. A whopping 79% of those surveyed said they told others about the poor treatment they received. Those businesses whose salespeople are trained to say and do whatever it takes to “jerk the check” are cutting their own throats. The 2012 American Express Global Customer Service Barometer shows that 66% of the people surveyed are actually willing to pay more to do business with a company which provides excellent customer service— up to 13% more. The same survey reported a satisfied customer customarily shares his buying experience with as many as 15 people. However, an unhappy customer may spew with indignation and fervor his lament of poor customer service to an average of 24 people. He may also vent his frustration online to untold more people. In the survey 24% admitted to talking about their experience via social media. The 2012 Barometer also found 55% of people backed out of a purchase when they received poor customer service. RHINO stands out from the common herd. In the past twelve months, 39.1% of all RHINO’s new orders have come from repeat customers— or first-time customers referred to us by previous clients. We are proud of earning the trust of our customers. We will honor that trust by our continued commitment to providing dependable, valued-added metal buildings with absolutely amazing customer service. The Better Business Bureau has awarded RHINO the highest score possible: A+. Ray Kroc, the genius behind the success of McDonald’s Corporation, believed, “If you work just for money, you’ll never make it, but if you love what you are doing and always put the customer first, success will be yours.” RHINO’s employees love what they are doing. The average tenure of our sales and customer service team is over ten years. That’s astounding in a business just celebrating its fourteenth anniversary this month. RESPECTFUL: We have a perfect right as consumers— indeed as human beings— to expect to be treated with respect. We want our questions and concerns treated seriously, without being made to feel inadequate because we don’t know all the answers. We want someone to really listen to us. No one wants to be treated as if they are just one more faceless prospect in a sea of endless calls. RHINO believes we should treat everyone with respect, regardless of whether they ultimately buy a steel building from us or not. We will listen to your questions, and give clear, concise answers. We treat every person we speak to in the same manner we would like to be treated. It’s just that simple. AVAILABLE: We’ve all experienced that automated runaround when trying to contact a business. You know the drill. “Press one for widget service. Press two for widget billing. Press three for widget order status. Press four for company hours. Press zero to speak to an operator.” So you press five and hear, “All of our operators are busy at the current time. Press one for…” And so it goes. RHINO answers are just a phone call away. Our phones are answered by living, breathing service professionals in our corporate headquarters in Denton, Texas. Whether you need help in determining the style, size, or options for your building, our friendly and experienced team is there for you every step of the way. KNOWLEDGEABLE: Nothing is more annoying than to finally reach a live person at a business, only to realize you’re speaking to someone overseas at a generic call center, reading from a slapped-together manual of pat answers. Or perhaps you’ve reached a new or untrained operator who can’t answer your questions or, worse yet, doesn’t seem interested in your call at all. As I said earlier, our steel building specialists at RHINO have an average tenure of over ten years with our company. They also have many decades of previous in the metal building industry. You can rely on the expertise of our steel building professionals. COURTEOUS: One-third of consumers in the 2012 American Express survey cited “a rude or unresponsive” customer service representative as their main reason for switching brands. At RHINO, we believe everyone deserves to be treated with utmost courtesy. Great customer service begins with old-fashioned good manners. DEPENDABLE: Ever waited for hours— or maybe even days— to receive a callback with an answer to a question, a promised piece of literature, or a solution to a problem? Maddening, isn’t it? Are they ignoring your request? Did your question somehow fall through the cracks? Do they really want your business? Suddenly you feel more like number and less like a valued customer. We strive at RHINO to provide prompt and dependable service. We want to earn your trust. We will do our best to be worthy of that confidence today and tomorrow. We are determined go the “extra mile” and exceed your expectations. SINCERE: Friendly service means nothing if it seems phony or insincere. No one likes to be served by an overly gregarious salesperson with a heavy-handed charm. At RHINO, we actually like our business and really love working with our customers. Many of our buyers have become true friends over the years. 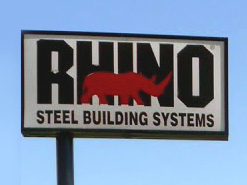 We love to hear their stories of successful RHINO metal building projects. In fact, we are planning to share many of those personal stories with you in upcoming blogs and newsletters! PROBLEM-SOLVERS: Sadly, some people find a company is all hearts and flowers while they’re being “wooed” to buy. After the order is placed, suddenly their “best buddy” in sales is “unavailable” when problems arise. RHINO never neglects or avoids the customer after the sales. We do our best to keep problems to an absolute minimum, but will not abandon our customers if a problem arises after the metal buildings have shipped. With all our combined years of experience, it is unlikely you can have any problem that we have not encountered— and solved— before. At RHINO we believe, as Macy’s Department Store’s Motto says, that we should “never fail to astonish the customer.” Let us astonish you today. Call: 940.383.9566. Share the post "RHINO Promises Amazing Customer Service for Our Steel Building Customers"